Mother Teresa’s belief of wealth should be distributed evenly; the dignity of a human being and helping the poorest of the poor affected her choices and her relationship others. Some of the people affected by her choices including herself were her family, people in the society and her relationship with God himself due to her religious calling which occurred at a young age. When Mother Teresa’s father died when she was eight years old, her family and herself held tightly onto their religious beliefs. Throughout Mother Teresa’s childhood and adolescent stages she had felt urge of a calling to serve God which occurred when she was twelve years old. Although she felt the calling to become a nun, she would have to give up her family which was far too soon as she was only young. As years had passed she had thought and reflected on her calling if she was to follow it or stay with her family. In five years’ time at the age of seventeen, Mother Teresa had decided become a nun. On September 1982, she moved away from her family to pursue her calling and travelled to India where she then never saw her family again. For many people, it would be hard to completely move away and ‘cut off’ a connection between themselves and their family especially if they had a close relationship together. Mother Teresa’s decision to do this was courageous but as well as her courage and determination to pursue her vocation as a nun and help others, she was dedicating her life fully to God. How her beliefs affected her choice: The vow of obedience to become a nun and the belief of service to the poorest of the poor had affected her choice on leaving her family. When she felt the urge of calling to serve God, to show her how she held tightly to her religious beliefs she obeyed God and become a nun although she was never to see her family again. By leaving her own family it showed she was committed was committed to helping God help others. 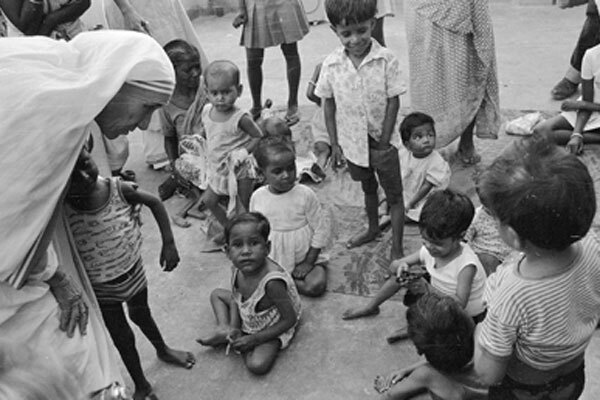 As Mother Teresa had pursued her calling as a nun she received another calling to help the poorest of the poor. Although at times her own life would be put at risk she continued to carry out her calling by helping others. She showed great compassion towards people in her society as well as the aged, disabled, the sick and the homeless. Throughout her life she continued and fully dedicated herself to God by helping other people. She provided the people food to help them survive, love, cared and looked after people as well as those with harmful diseases, lepers and people who were dying from AIDS as many would refuse to look after or love them. Mother Teresa had done this as she believed and saw God in disguise within the individual pleading for assistance to be helped out and to be loved. Throughout her years Mother Teresa established hospitals for the people who were sick, created a religious order and charities which have spread around the globe to promote the fair treatment of others and care for the needs of people. How her beliefs affected her choice: The belief of dignity of every human being, wealth should be distributed evenly and service to the poorest of the poor had affected her choices as she was to think about other people and not herself. This lead to her helping people in society. In essence, Mother Teresa’s beliefs affected her choices and relationship with others, society, family and God as she had decided to accept the calling. By accepting the calling from God to become a nun she took the vows of poverty, chastity, obedience and a fourth vow which was to serve the poorest of the poor. By taking these it allowed Mother Teresa to dedicate herself and her love only to God and the service of others. How her belief affected her choice: By becoming an official nun it affected her choices as with chastity, she was to give up her family. The vow of poverty meant she had to give up all her materialistic goods, obedience affected her choices as she had to avoid temptations such as buying things just for herself and the vow/belief of helping the poorest of the poor affected her choices as she was to put other people before herself.